Pulse jet baghouse is an improved new type and high efficient dust collector on the basis of fabric filter. Pulse jet control device is adopted in pulse-jet bag filter, which has 99% dust collect efficiency. It is a kind of new dust separator with high efficiency, which is widespread applied in various dust-cleaning processes. 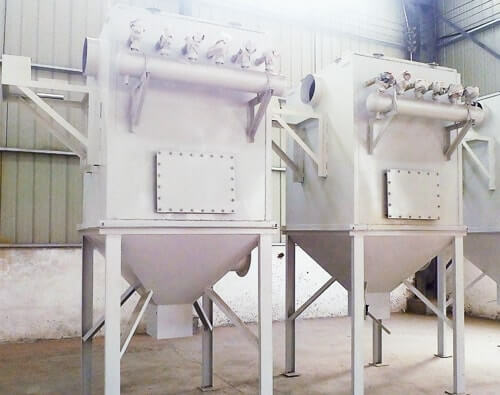 Pulse-jet baghouse dust collector has many advantages such as high filter efficiency, stable performance, small footprint and large amount of air filtration, etc. Different from traditional dust collectors, pulse-jet fabric collector improves the structure and pulse valve, solves the problem of open-air placement and compressed air source. 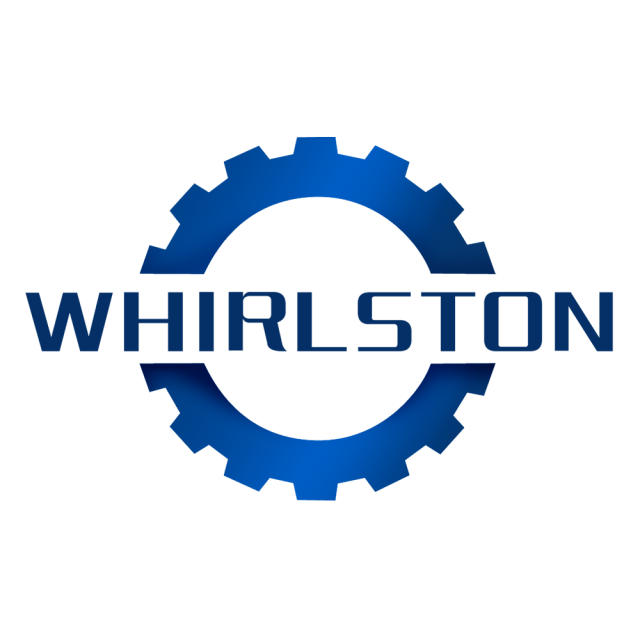 ◇ Wide application and high practicability. Pulse-jet bag filter dust collector can control dust of different particle diameters and properties. It is widely used in many kinds of industries, such as machinery, chemical industry, metallurgy, construction, industrial and mining enterprises, and PCB Recycling Plant, Aluminium-Plastic Dry Separation System. ◇ Structure of machine is rational, the maintenance being convenient. Use of pulse-jet baghouse is flexible. 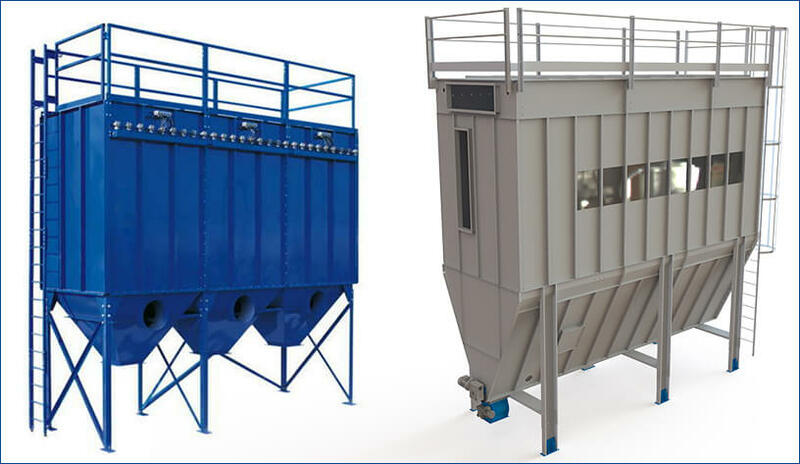 It can be used large dust collector directly, also can be equipped with medium and small units. ◇ Inlet and outlet are compact, air resistance is little. Its frame adopts sealing materials, which reduces air leakage and enhances good tightness. ◇ High dusting efficiency. It can collect tiny dust with 0.3 microns particles size with 99% dusting efficiency. Cleaning process can be completed one time, which reduces the energy consumption and raises the life of filter bags and valve. Pulse-jet fabric collector is mainly composed of dust hopper, upper, middle and lower boxes. When working, dust enters into dust hopper through the air inlet firstly. 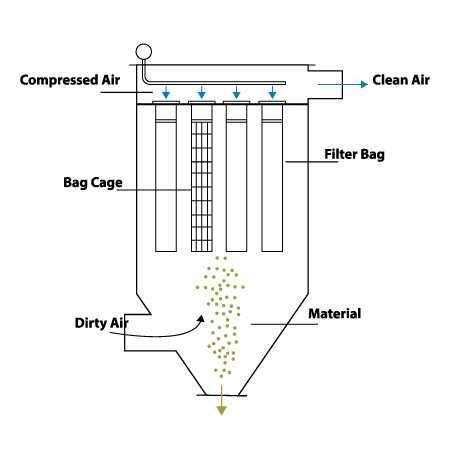 Coarse grains of dust directly drops into the bottom of dust hopper, at the same time, fine grains of dust enters into the middle and lower box with the help of airflow. Then dust attaches to a filter bag for filtration, besides, the filtered air enters into upper box and discharges into atmosphere by exhaust blower. The resistance of machine will rise to set value when dust on the surface of filter bag is increasing, at the same time, time relay sends out a signal that means programmer has to work. Turn on the pulse valve one by one so that compressed air will clean the filter bag through jet. Finally, filter bag begins to swell, meanwhile, dust separates from filter bag quickly and falls into dust hopper under the effect of reverse airflow. Dust will be discharged from dumper after blowing. 1. Regularly discharge and maintain pulse jet baghouse according to the dust content of machine. 2. Regularly drain off water according to the water accumulation in air. 3. Check whether the dust cleaning system of machine is working normally. The filter bag should be cleaned and changed timely. 4. Check equipment’s running situation periodically according to the resistance of machine. 5. Inspect and change the wearing parts in time. 6. Check whether the electronic cabinet is sealed, and often clean dust in the electronic cabinet.